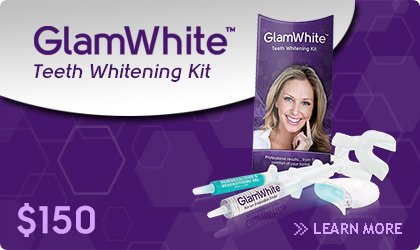 GlamWhite teeth whitening products deliver professional results without the expense, hassle or tooth sensitivity of a chair-side whitening treatment. Our teeth whitening gels are manufactured in the US with natural and organic ingredients and were formulated in conjunction with a respected cosmetic dentist recognized as a bleaching expert. 3) our glamorous on-the-go Whitening Pen. Each product was designed with results and comfort in mind, based on years of bleaching experience of our dental partner and our manufacturer. 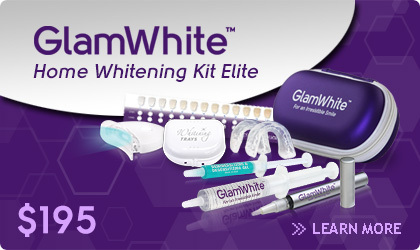 If you want that Hollywood smile without paying what the stars pay for their beautiful white teeth, GlamWhite is the most practical solution available today. Offered at outrageous prices by the most discriminating dentists, you can get your own piece of stardom at a fraction of the cost.